Jasper Avenue has a long tradition as Edmonton’s centre of commerce and financial enterprise. At one point in the early 1900s, the thoroughfare was home to more than a dozen financial institutions handling transactions in the booming frontier town. In 1914, Edmonton had 26 banks, and most of them were on Jasper Avenue. They included Imperial Bank, Bank of Toronto, Dominion Bank, Bank of Nova Scotia, Merchants Bank, Molsons Bank, Bank of Ottawa, Bank of Montreal, Quebec Bank, Banque Jacques-Cartier, Standard Bank and Royal Bank of Canada. There were trust companies, too, like Canada Permanent and National. Edmonton’s first chartered bank, and the first branch between Calgary and the Arctic, was the Imperial Bank of Canada. It officially commenced Edmonton operations on September 4, 1891, just days after three of its officers rode the second train into Strathcona on the Edmonton & Calgary Railway. Edmonton branch manager G.R.F. Kirkpatrick got the venture going on the second floor of a building on the west side of 102nd Street, just north of 100th Avenue, in a building that also contained a saloon. Kirkpatrick relocated the branch in 1893 to the corner of Jasper Avenue and McDougall Avenue (now 100th Street), where the bank rented a corner section of the building. An all-new building was constructed on the site in 1907, a grand Classical Revival sandstone structure which cost $90,000. Its entrance portico was supported by giant columns three storeys tall, elevated on one-storey-high plinths. The scale of the structure, with those columns, its stone staircase and wrought iron entrance doors, dwarfed pedestrians and established a very powerful presence on Jasper Avenue. The main hall was tiled with white marble mosaic, with a border of coloured marble. A special room was designed for women customers who wished to deposit their real estate gains without the knowledge of their husbands. The building survived until the boom days of the late 1940s, when the Imperial Bank apparently decided a modern structure was in order. And so down it came in the fall of 1950 to make way for the six-storey Imperial Bank, opened in 1954, and which became the Canadian Imperial Bank of Commerce. Built in 1907, the grand columned building on the northwest corner of Jasper Avenue and 100 A Street was originally home to the Merchants Bank, which had started Edmonton operations in 1898. until it amalgamated with the Bank of Montreal. For a time, the top floor was used by staff of the Grand Trunk Pacific Railway. Merchants Bank amalgamated with the Bank of Montreal and the building at 10050 Jasper Avenue was bought by the Bank of Nova Scotia in 1923. It served as that bank’s main branch for the next 33 years, and was demolished in 1956. The Bank of Montreal started Edmonton operations on September 8, 1903 with an office on Jasper Avenue and 100 A Street. When the bank amalgamated with the Bank of British North America (BBNA) in 1918, operations were shifted to the BBNA building, which had opened in 1916 on the southeast corner of Jasper Avenue and 101st Street. The former Bank of Montreal building was taken over by the Bank of Toronto. In the early 1920s, business was so good at the new Bank of Montreal location that an addition was constructed to the south in 1925. Both buildings were demolished in 1962 to make way for a new modernist-styled headquarters, designed by George Lord of the renowned Edmonton architects Rule, Wynn and Rule. The building, at 10089 Jasper Avenue, was clad with custom green-glazed brick and vertical pillars of pink and black Morton gneiss from Minnesota, one of the oldest rocks on the planet. The swirling striations in the stone were oriented to flow upward along the building’s face. That 1963 building, which came to be known as BMO63, is slated for demolition now as well after a citizen-led protest was unable to save it. Two years after the Bank of Montreal built its new Jasper Avenue branch, the Royal Bank of Canada opened one of their own right across 101st Street. The $3.5-million building was officially opened in February 1965. The original branch at 10023 Jasper Avenue, which started operating in 1906, was knocked down in 1966. The clippings files at the City of Edmonton Archives are spiced with stories of the formidable challenges faced by crews tasked with taking down the “built to last” early 20th century bank buildings. 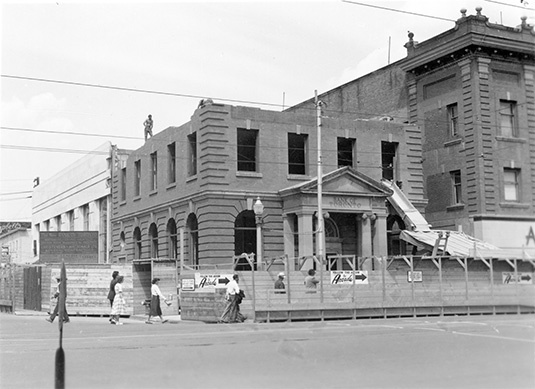 As demolition work proceeded in 1949 on the 46-year-old Bank of Toronto building, the Edmonton Journal reported that the vault of the bank at 10038 Jasper Avenue was proving tough to crack. $ Molsons Bank, 10076 Jasper Avenue. $ Banque d’hochelaga, 10263 Jasper Avenue. $ Banque Jacques-Cartier, south side of Jasper east of 100th Street.